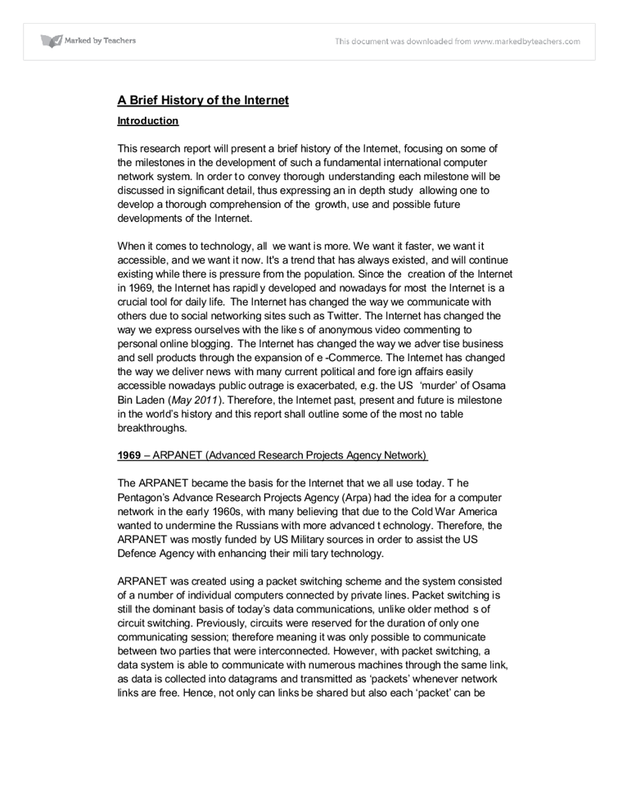 This research report will present a brief history of the Internet, focusing on some of the milestones in the development of such a fundamental international computer network system. 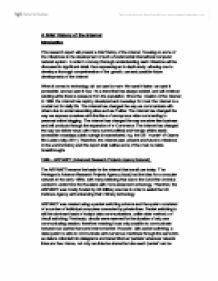 This research report will present a brief history of the Internet, focusing on some of the milestones in the development of such a fundamental international computer network system. In order to convey thorough understanding each milestone will be discussed in significant detail, thus expressing an in depth study allowing one to develop a thorough comprehension of the growth, use and possible future developments of the Internet. When it comes to technology, all we want is more. We want it faster, we want it accessible, and we want it now. It's a trend that has always existed, and will continue existing while there is pressure from the population. Since the creation of the Internet in 1969, the Internet has rapidly developed and nowadays for most the Internet is a crucial tool for daily life. The Internet has changed the way we communicate with others due to social networking sites such as Twitter. The Internet has changed the way we express ourselves with the likes of anonymous video commenting to personal online blogging. The Internet has changed the way we advertise business and sell products through the expansion of e-Commerce. The Internet has changed the way we deliver news with many current political and foreign affairs easily accessible nowadays public outrage is exacerbated, e.g. the US ‘murder’ of Osama Bin Laden (May 2011). Therefore, the Internet past, present and future is milestone in the world’s history and this report shall outline some of the most notable breakthroughs. The ARPANET became the basis for the Internet that we all use today. The Pentagon’s Advance Research Projects Agency (Arpa) had the idea for a computer network in the early 1960s, with many believing that due to the Cold War America wanted to undermine the Russians with more advanced technology. Therefore, the ARPANET was mostly funded by US Military sources in order to assist the US Defence Agency with enhancing their military technology. ARPANET was created using a packet switching scheme and the system consisted of a number of individual computers connected by private lines. Packet switching is still the dominant basis of today’s data communications, unlike older methods of circuit switching. Previously, circuits were reserved for the duration of only one communicating session; therefore meaning it was only possible to communicate between two parties that were interconnected. However, with packet switching, a data system is able to communicate with numerous machines through the same link, as data is collected into datagrams and transmitted as ‘packets’ whenever network links are free. Hence, not only can links be shared but also each ‘packet’ can be routed independently, therefore utilizing the available link capacity, minimizing response time and increasing the robustness of communication. On 29th October 1969 computers at the University of California, Los Angeles and Stanford connected for the first time – therefore initiating the first 2 hosts. The first message ever sent over the Arpanet was supposed to be ‘Login’ in order to take control of the over computer, however, the UCLA to Stanford link crashed on the letter ‘g’. Hence, the first ever message was actually just ‘Lo’. By December 2 more computers were added to the network, so in 1969 4 hosts located at The University of Utah, The University of Los Angeles, The Stanford Research Centre and The University of Santa Barbara were directly connected. ★Evidently ARAPANET was a highly significant event in the Internet’s history as the development of the first functioning packet switching network paved the way for future improvements. As a result, still today in 2011, the Internet is based on ARPANET’s modern (in 1969) packet switching system and ultimately ARPANET became the core of the global Internet network to come, hence ARPANET was a crucial event in the Internet’s history. Ray Tomlinson a BBN employee devised the first electronic mail for APRANET, while trying to develop the TENEX operating system in the early 1970s, with the local email programs called SNDMSG and READMAIL. In late 1971, Tomlinson created the first APRANET email application by adding a program called CPYNET to the SNDMSG when he updated it. The new program CPYNET was capable of copying files over the network. Using this, Tomlinson was able to send the first ever email to his colleagues announcing the existence of network email and giving instructions on how to use the new program. Tomlinson also made the notable decision to use the ‘commercial at symbol - @’ to separate the user and host names, providing the naturally meaningful notation “user@host” that is the standard email addressing today. Tomlinson claimed he chose the @ symbol because it made sense and was not used anywhere else. Although these early programs had simple functionality and were command line driven, they established the basic transactional model that still defines the technology today. ★Similar to ARPANET, the reason why the development of email is so significant is due to its modern day status (in 2011). Ray Tomlinson’s basic invention in 1971 has advanced dramatically to what we now use in daily life. Taking into consideration daily communication, we in the 21st century would struggle to function without the use of email. Bosses contact their employees, employees contact each other and clients, friends contact friends – basically everyone uses email. No matter where you are in the world, providing you have an Internet connection, you can communicate with anyone, and it is the fact that you can have worldwide contact without extensive costs or basic face-to-face communication that makes email so important. Although some may see this is running human contact and communication, the fact is email is practically vital in today’s society (2011). The IPSS was created in 1978 through the collaborative works of the UK General Post Office, the Western Union Company and the United States data communications network Tymnet. Available 24 hours a day 7 days week, the IPSS have a selection of three different speeds of PSS lines, and accordingly the faster lines would cost the most to rent. This milestone in Internet development led to rapid IPSS expansion and by 1981 the network had developed to cover Canada, Hong Kong and Australia, alongside the previous Europe and the USA coverage. Following which, by the 1990s the IPSS were providing a worldwide networking infrastructure. Bulletin Board Systems were in their prime during the late 1970s to the mid 1990s. Bulletin board systems are just like physical office note boards: anyone with access can “post” a message or a “reply”. When a message is “posted” the note is automatically sent by e-mail to the board, therefore, you need someone to manage said board. Hence, BBS’s have “system operators” (‘SysOp’ or ‘Host’). The “host” stores all the messages on their computer equipment and the emails get reproduced to make them accessible for all the other bulletin board users. Therefore, through this method users can copy a message onto their own computers, or “download” a digitalized picture, sound recording or movie. However, bulletin boards do not have to be connected to the Internet; subscribing computers can be connected through any independent, private network. Many bulletin boards are run by hobbyists and have a few hundred subscribers, whether paid for or free. Ultimately, Bulletin Board Systems were in many ways the ancestor to the modern form of the social networking we have today. Newsgroups use the same principles as bulletin boards to function, but instead of just one Service Provider being responsible for storing the messages, several subscribing Service Providers share responsibility. Each separate provider is accountable for “posting” messages from its members. Incoming messages are “flooded” through the system until all the providers have completely their jobs. Newsgroups are divided into particular topics, which provide the focus fro the newsgroup’s discussion. These discussions can be monitored or moderated by a “host” who can delete off-topic messages or control or guide different hierarchies. Nonetheless, many newsgroups are not moderated at all; old messages are simply erased after a specific amount of time. It is indisputable that Newsgroups and Bulletin Boards are a milestone in the development of the Internet with todays online communication vastly developed with the likes of Twitter and common forums. Systems that for some play a significant role in daily life from making work and personal activities follow much more effectively. However, with everything there are of course problems linked to present day updates on newsgroups and bulletins, which will be discussed later on. The acronym TCP/IP stands for Transmission Control Protocol / Internet Protocol and is the current Internet Protocol Suite networking standard. TCP and IP are just two protocols of an entire ‘family’ of rules. TCP/IP was first used in 1983 despite having been developed many years prior. The Defence Advanced Research Projects Agency (DARPA) created the project as a means of unifying an array of networking methods. However, it was on January 1, 1983 (flag day) that TCP/IP was in full use after ARPANET migrated from the old NCP Protocol. TCP/IP was a fundamentally development in the Internet as it made it possible to join almost any network together, regardless of what their characteristics were. Transmission Control Protocol allows data to travel from one network device to another; TCP uses a retransmission strategy to insure that data does not get lost in transmission. Internet protocol, the method by which information is sent between any two Internet computers on the Internet. Together TCP/IP governs the connection of computer systems to the Internet. Implemented by ARPANET in 1984, the Domain Name System, or DNS, is an internet service that translates domain names into IP addresses. Initially when the Internet had just begun, systems were identified by a 32 digit number known as an IP address and if computers wanted to connect to each other this numerical address was required. Still today the Internet is based on IP addresses; nonetheless instead of having to remember numerous 32 digit series we are able to insert alphabetical addresses. Under the Domain Name System, an Internet address has four elements; a server prefix, a domain name, a domain extension, and a country code (the only optional element). Therefore, as it is the DNS that allows us to use our browsers and access a page via an alphabetically address, such as www.google.com, rather than have to type numerical IP address such as 198.105.232.4, the DNS has made the Internet much more user friendly. Now we can access server computers, individual files, and email addresses all with names and plan English instead of difficult to remember 32 number series. Consequently, DNS is a highly significant development in the Internets history as without it people would still be accessing websites by their servers IP address. Test to see how many 32-bit IP addresses you can memorize in comparison to how many words; it is just impractical to remember numbers over words. Hence, the DNS was a natural progression within the Internet. ★Domain Name System – the DNS is so significant as it simplifies the Internet for absolutely everyone to use with ease. No longer do we have to remember a series of numbers but now we only have to remember easy website addresses, like www.twitter.com. Ultimately, down to the unpretentious reason of remembrance the DNS is so important. By 1987 the amount of hosts on the Internet had rapidly grown to 10,000, a collaboration of clients and severs. This exponential change was very unexpected and showed no signs of slowing down. In 1990, the first commercial ISP was implemented: Brookline, Massachusetts-based The World. The company was the first in the world to provide commercialize dial up internet and although at the time many other ISP companies, such as PSINet, Netcom and UUNET were breaking into the service provider business, it was The World that succeeded beyond the rest in the commercial market. It is because of ‘the Bay States’ ‘The World’ that the internet has become easier to access and therefore even computer ‘newbie’s’ can effectively browse the web. ★First Dial-Up – ‘The World’ is so substantial as it started the ball rolling for worldwide availability online. Once ‘The World’ provided dial-up to those in Massachusetts and America, it fuelled competition amongst other Internet providers and as a result in 2011 we have broadband available to have fast streaming access online, with simultaneous phone use, and more importantly, we have wireless Internet access. Therefore, it was dial-up which provided the foundations for modern technology of broadband and wireless and so is very important in the Internet’s history. The European Organization for Nuclear Research, known as CERN, is a community of about 8,000 scientists from around 60 countries. Although CERN holds some remarkable achievements, one of the most prominent breakthroughs was in 1989 when scientist Tim Breners-Lee invented the World-Wide-Web. The project entitled ENQUIRE was initially designed to facilitate scientists with information sharing among all the different institutes and universities around the world. The first ever website went online in 1991, and is accessible today to view on the CERN website: http://info.cern.ch/NextBrowser.html The first web browsers ran on the NeXT platform however only a few users had access to this software, therefore CERN soon provided a much simpler browser that could be run on any system. In December 1991 the first web server came online in the United States in the research institute: Stanford Linear Accelerator Centre (SLAC) in California. Nonetheless, at this point there were only really two kinds of browsers. The first on the NeXT was very sophisticated yet was not globally accessible and the second was a ‘line-mode’ browser that lacked sufficient power and wasn’t very user-friendly. Consequently, later on independent programmers (requested by CERN) developed more efficient browsers for everyone to use. Ultimately, the World Wide Web should not be mistaken as a synonym for the Internet as the Web is simply a service the Internet offers. The WWW is now a global information medium which people connected to through the Internet. Therefore, it is unquestionable that the development of the World Wide Web was a crucial progress in the Internet’s history, since it can be argued that the creation of the WWW is why the Internet is so accessible on such a vast scale for everyone today. ★World Wide Web, CERN – when anyone thinks of the Internet, most are actually thinking of the World Wide Web, as in the 21st century the World Wide Web is the fundamental tool that the majority to use. The interlinking of all webpages accessible via the Internet is what makes the Internet so special: being able to access information instantly anywhere in the world. Therefore, as it is the WWW that allows users to view any webpage via hyperlinks, the WWW is one of the most significant aspects of the Internet’s history. The Mosaic browser was created at NCSA (National Centre for Supercomputing Applications) and was released in January 1993. It is justifiable to assert that the development of Mosaic deserves the credit of being the browser that led to what is known as the ‘Internet Boom’. Mosaic was one of the first graphic user interface (GUI) browsers and its features are still replicated in modern browsers such as Firefox 3.6 and Google Chrome today. Although Mosaic was not the first ever web browser for Windows, (it was actually called Cello but that isn’t very notable) it was ultimately the best around. A concept that put Mosaic above the rest was the simplistic of the browser, meaning amateurs could use and install with no problems. Therefore, Mosaic was essentially providing the everyday person with Internet access and so enhanced the ‘Internet Boom’. Moreover, the key feature that Mosaic offered was the ability to view text and images inline with one another. Previously on other bowsers you were required to open images in separate windows, but now both could be displayed on the same webpage, which was clearly very alluring to the users. Overall, it is reasonable to say that Mosaic initiated the ‘Internet Boom’ of the 1990s and is perhaps responsible for how we generally access the Internet today, especially the way in which we search using web browsers. By 1996 the word ‘Internet’ had become as common in daily use as ‘Facebook’ or ‘Twitter’ is today. At this stage the vast majority of people were aware of the Internet, yet many had a very poor understanding of it technically was, and as a result the word became a sort of ‘vogue word’ through inappropriate overuse. Furthermore, the word practically became merged with the ‘World Wide Web’ as the two were often referred to as the same thing (much like today). In 1997 Internet users had soared to 10 million, thus highlighting the popularity of the global network. Compromised of even more clients and servers, the Internet had seen a dramatic and exponential increase of users. Even before the development of the World Wide Web, there were already search engines attempting to organize the Internet. Archie search engine was the first Internet search engine that allowed users to find specific files. Archie was created by students at McGill University in Montreal and implemented by creators Alan Emtage, Bill Heelan and J. Peter Deutsch. This development was than improved on by WAIS and Gopher in 1991. All three (Archie, WAIS and Gopher) existed prior to the invention of the World Wide Web but all continued to index the Web and the rest of the Internet for many years after the Web came online. As the World Wide Web grew, the creation of search engines and Web directories prevailed as a means of tracking pages on the Web to allow users to easily locate things. The first full-text Internet search engine was WebCrawler in 1994; prior to WebCrawler only Web page titles could be searched. The first search engine to achieve commercial success was Lycos created in 1993, which began as a university project. During the late 1990s, both Web directories and search engines became very popular. Respectively, Yahoo! (founded in 1994) and Altavista (founded in 1995) became the Web search engine industry leaders. In the new millennium, the directory model had begun to give way to search engines. For instance, Google (founded in 1998) developed many new approaches to search the web, such as relevancy ranking. By this point, directory features although still commonly available, fell into the shadow of search engines. About 1996 the relevancy ranking (the method search engines attempt to sort results by best suited) first became an issue as it became impractical to review full list of results. Consequently, algorithms for relevancy ranking are constantly, even today, being improved. For example, Google’s PageRank method is the most notable, but all major search engines continually refine their systems too in order to improve result ordering. By 2006, rankings became more important than ever to the extent in which industries have developed “search engine optimizers” positions to improve web-developers search ranking, and as a result an entire body of case law has developed surrounding the matters that affect search engine ranking methods, such as the use of trademarks in metatags. Modern update: On June 3 2009, Microsoft launched a brand new search engine called Bing. Following the launch, in July Microsoft and Yahoo! Declared an agreement in which Bing would power Yahoo! Search. ★Search Engines – Like the DNS, Search Engines are so important as they have simplified Internet use for everyone. No longer do we have to know the specific webpages that we need, we can simply search a few words, and abracadabra, you are presented with numerous webpages, assorted in the relevance order. Therefore, as Search engines allow users to locate information instantly without any hassle, the development of search engines is one of the most important events in the Internet’s history. The Dotcom Bubble was an economic bubble that incorporates the time period of approximately 1995-2000 when equity values in stock markets (in industrialized nations, particularly the USA) increased rapidly due to the growth of the Internet sector and related fields. As a result stockholders would invest ridiculous amounts into Internet-based companies excepting huge amounts in the future, nonetheless, they ignored the typical protocol of truly accessing the real benefits and accordingly loss vast amounts when the ‘bubble’ eventually burst. Marked by the spectacular failure of the newly profound Internet-based companies, who simply added an ‘e-‘ prefix and/or ‘.com’ suffix to their name in order to make their stock prices shoot up, the Dotcom Bubble Burst numerically on Friday 10th March 2000. The U.S. Federal Reserve increased interest rates six times over 1999 and early 2000 contributing to the bubbles bursting. However, ultimately the NASDAQ Composite index peaked (5,048.62) at more than double its value the year before, hence destroying the economically internet-based company climate as the subsequent years signalled the beginning of the end as stock markets could never reach that high again. A blog, short for Web log, is a type of website or a certain section of a website that allows user interactivity via leaving comments and/or messaging each other via widgets. It is this interactivity that distinguishes blogs from other static websites. Blogs allow users to publicly express their feelings, likes and dislikes, daily events, and life in general via online journals that are typically updated daily. There are also professional blogs such as Journalist articles etc. Although most blogs also primarily textual, most blogs allow users to upload graphics, sound and videos, other blog links and WebPages. Microblogging is also another type of blogging that features short posts on average, such as Twitter or Tumblr. As of the 16th February 2011 there were over 156 million public blogs in existence. Censorship of the Internet is when organizations (such as schools) or more particularly the government, control or suppress the publishing or access of certain information on the Internet. However, unlike offline censorship, the national boarders are far easier to break. For example, countries that ban certain information can be simply found on websites hosted outside that particular country. Therefore, a country can try to prevent its citizens from viewing these outside websites through various methods. For instance, some countries use make the ISP provide a fake “Not Found” error message upon the request of a blocked Internet page. Nonetheless, ultimately trying to censor the Internet is very difficult as underlying distributed technology of the Internet makes it easy in countries like North Korea (who don’t even have broadband!) use Pseudonymity and data havens to allow unblocked, unconditional free web browsing and free speech guaranteeing no track to the user. VoIP stands for Voice over Internet Protocol and is a way to transmit our voice through the internet (kind of like a telephone online). Anyone can buy themselves a VoIP phone that will connect to the internet to transmit sound. Ultimately, VoIP calls are much cheaper than traditional landline or mobile phone calls as there in no extra cost beyond what you are paying for your broadband. VoIP works by sending voice data in packets using the computers IP rather than the traditional circuit transmissions of the PSTN. Currently there are several Internet telephony applications available for users. For example, CoolTalk and NetMeeting are already apart of Web browser bundles or alternatively, some software’s stand alone such as Ventrilo. ★Recently (around 2011) – ultimately, ‘recent’ developments essentially emphasise how far the Internet has progressed from ARPANET in 1969. By analysing modern achievements such as Twitter ©, you can learn about the behaviour of society. No longer do we send letters to communicate with friends, very few even use telephones, the vast majority of communication in the 21st century is done via the Internet. Some may assert that the development of the Internet is destroying personal interaction, just observe the amount of online dating sites. However beneficial the Internet may be professionally such as international trade deals, ultimately, when it comes to personal lives, the vast majority of the new generations have become obsessed with online communication, yet it is a matter of opinion whether this is a positive thing or not. Nonetheless, ‘recent’ developments are therefore important as they shed light on what could happen in the future. Will technology truly take other the vast majority of communication? I also noticed that the filing cabinets were not regularly locked after use, probably for the convenience of not having to turn a key every time a record is required. This is a lazy oversight, as theoretically anyone could just dander into the office and look at their records! To ensure that the hardware works with the software, up-to-date drivers should be installed for the hardware and compatibility should be checked with the user's configuration. Network Connectivity The physical (wired or wireless) and logical (protocol) connection of a computer network or an individual device to a network, such as the Internet or a LAN. o The sales for each type of pie o The amount of profit that each filling brings to the business o The profit that the sales of drinks, salads, and hot snacks bring to the business Deficiencies Of The Current system o The pies are made in a kitchen, five miles away, from the main office. The OSI model describes the flow of data in a network, from the lowest layer (the 'Physical Connections' layer) up to the layer containing the user's applications. � The Application layer represents the level at which applications access network services.